On the basis of the Written Examination held on 31/08/2017 (Art Teachers) and subsequent Certificate Verification process held on 07/02/2018 & 08/02/2018 at Sankethika Vidya Bhavan, Masab Tank, Hyderabad and on 20/07/2018 at TSPSC Office, Nampally, Hyderabad for Direct Recruitment (General) to the post of Art Teachers in various Residential Educational Institutions Societies, 355 candidates with the following Hall Ticket Numbers have been provisionally selected for appointment to the post of Art Teachers in various Residential Educational Institutions Societies Notification No.17/2017, Dt: 14/04/2017. The selections are published here-with subject to the following conditions. With this Notification of selection, the General Recruitment process notified vide Notification No.17/2017 for the post of Art Teachers in various Residential Educational Institutions Societies has been finally concluded except for PH vacancies. 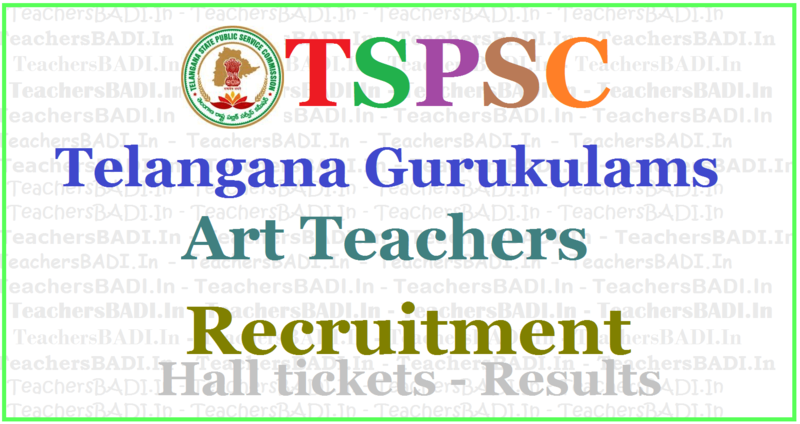 TSPSC Gurukulam Art Teachers Results, Certificates verification dates, Web Options 2018. 2nd Spell result Notification for the post of Art Teacher Vide Notification No.17/2017. In continuation to the Result Notification Dt: 31/01/2018, it is hereby notified that on the basisof Written Examination held on 31/08/2017 for ART TEACHER in various Residential Educational Institutions Societies, 66 candidates with the following Hall Ticket Numbers are provisionally picked up in the ratio of 1:2 for Certificate Verification of 2 nd spell due to short fall of candidates in certain categories. The Verification of Certificates will be held on 20/07/2018 at TSPSC office from 10:30 AM onwards. The candidates who are called for Verification of Certificates have to produce the following certificates in Original along with a set of Photostat copies duly attested by Gazzetted Officer at the time of Verification of Certificates, failing which, they will NOT be admitted in subsequent process of selection. The candidates who have attended for Certificate Verification from 07/02/2018 to 09/02/2018 for the posts of Art, Craft and Music Teachers are hereby directed to exercise the Web Option for the various Societies and Zonal preference to the said posts from 02/05/2018 to 04/05/2018, failing which his/her candidature will not be considered for selection. Note: The candidates satisfied with earlier given web options may not give again. Please visit Commission’s website (www.tspsc.gov.in). Telangana State Public Service Commission (TSPSC) has released the preliminary answer key of main examination for physical director (school) and written exam for art, craft and music teacher on its official website. Candidates can access the answer keys of these examinations by clicking on the links below. The commission conducted the main examination for physical director (School) on September 9 and written exam for the posts of art, craft and music teacher on August 31 and September 1. Candidates can raise objections online on TSPSC website through the link provided from September 14 to September 18. Objections received after the due date will not be considered. Candidates must submit objections only in English and only as per the order of questions appearing with the question numbers allotted by TSPSC. TCC (Technical Certificate Course) in Drawing . 2 Art Teachers in Mahatama Jothiba Phule Telangana Backward Classes Welfare Residential Educational Institutions Societies. 3 Art Teachers in Telangana Minorities Welfare Residential Educational Institutions Societies. AGE: Minimum 18 years & Maximum 44* years. The age is reckoned as on 01/07/2017 (Rule- 12(1)(a)(v) of State and Subordinate Service Rules). *As per G.O. Ms. No. 329 GA(Ser.A) Dept., Dt. 27/07/2015 read with G.O. Ms. No. 264 GA(Ser.A) Dept.,Dated: 26-07-2016,the upper age limit is raised up to 10 years. N.B. : 1) No person shall be eligible if he/she is less than 18 years of age. 2)No person shall be eligible if he/she crossed 58 years of age (Superannuation age). a) FEE: (Remittance of Fee) Each applicant must pay Rs. 200/- (RUPEES TWO HUNDRED ONLY) towards Online Application Processing Fee. This apart, the applicants have to pay RS. 120/- (RUPEES ONE HUNDRED AND TWENTY ONLY) towards Examination Fee. However, the following category of candidates belonging to Telangana State only are exempted from payment of Examination fee. a) SC, ST, BC & PH. Edit your application: Further, candidates will be allowed to Edit their applications for correcting the fields which were wrongly entered by him/her on 12/05/2017 and 13/05/2017. The Edit option will not be considered more than one time. Hence, the candidates are requested to note that Edit of data fields may be attempted with utmost care because, once edited, the application form will be finally submitted and no subsequent changes can be made.